Node 1: Cyathaspidiformes: dermal ornamentation of parallel, longitudinal, and finely crenulated dentine ridges. Node 2: Pteraspidiformes: dermal ornamentation of concentric and serrated dentine ridges. Separate orbital, pineal and rostral plates, median dorsal spinal plate. The Heterostraci, or heterostracans, is a large clade of the Pteraspidomorphi, i.e. a group of fossil, armored jawless vertebrates, which lived from the Early Silurian to the Late Devonian (about 430 to 370 million years ago). They generally possess a fusiform head armor and a fan-shaped tail. Some forms, however, can have a rather depressed armor, with broadly expanded branchial plates. Some text-books still include the Astraspida, Eriptychiida and Arandaspida in the Heterostraci, but heterostracans clearly differ from these groups in having a single, common branchial opening on each side. The protopteraspidid Doryaspis nathorsti, from the Lower Devonian of Spitsbergen. Heterostracans are represented by nearly 300 species. They were marine but lived in sandy lagoons or deltas. Some species, however, are regarded as fresh water. They are known exclusively from North America, Europe and Siberia. They probably fed by scraping the bottom with their fan-shaped oral plates that armed their lower lip. They were poor swimmers and probably bottom-dewellers. It has been suggested that their posteriorly placed common gill opening could serve as a jet propulsion device and that made them moved like Cousteau's diving saucer. Although most heterostracans are relatively small (5 to 30 cm in total length), some of them, the Psammosteidae, could grow to a very large size (up to 1.5 m in length) and developed steer-like branchial plates. A single, common external branchial opening on each side of the head armor. Heterostracans are characterized by a single, common external opening on either side of the head armor (red arrow). The heterostracan head armor comprises large ventral and dorsal shields and a variable number of separate plates, laterally (cornual, branchial plates) and around the mouth (oral, postoral, orogonal plates). In some taxa (Pteraspidiformes, Traquairaspidiformes), the dorsal shield can be compound of several distinct plates (orbital, pineal, rostral), but there always remains a large median dorsal "disk". Since heterostracans have no calcified endoskeleton, their internal anatomy is only known from the impressions of the internal organs on the internal surface of the dermal armor. One may trace the impressions of the brain, gills, eyeballs, paired olfactory organ, and two distinct vertical semicircular canals of the labyrinth. Although paired, the olfactory organs seem to have opened ventrally into a large, median inhalent duct, as in extant hagfishes (see Hyperotreti). Most heterostracans fall into two major clades, the Cyathaspidiformes (Silurian-Early Devonian) and the Pteraspidiformes (Late Silurian-Late Devonian). There is, however, a number of minor taxa of debated affinities (Traquairaspidiformes, Lepidaspis, Tesseraspis, Cardipeltida, Tolypelepida). Cyathaspidiforms are characterized by the parallel and finely crenulated dentine ridges which form the ornamentation of the dermal plates. Some cyathaspidiforms, the Amphiaspidida, display a remarkable adaptation to benthic habits, with entirely fused plates of the armor and a peculiar opening near the orbit, which may as served as a spiracle. Pteraspidiforms are characterized by concentric dentine ridges with serrated margins. They usually have a median, spine-shaped dermal plate, and their dorsal shield consists of five separate plates (a dorsal "disc" and two orbital, one pineal, and one rostral plate). They also have separate branchial and cornual plates. Pteraspidiforms and cyathaspidiforms are probably sister-groups, and the other, minor groups are regarded as "basal" heterostracan taxa. Broad, D. S., and Dineley, D. L. (1973). Torpedaspis, a new Upper Silurian and Lower Devonian genus of Cyathaspididae (Ostracodermi) from Arctic Canada. Contributions to Canadian palaeontology. Bulletin of the Geological Survey of Canada, 222, 53-91. Blieck, A. (1984). Les Hétérostracés Ptéraspidiformes. Systématique, phylogénie, biostratigraphie, biogéographie. Cahiers de Paléontologie, Centre national de la Recherche scientifique, Paris. Denison, R. H. (1964). The Cyathaspididae, a family of Silurian and Devonian jawless vertebrates. Fieldiana: Geology, 13, 311-473. Denison, R. H. (1966). Cardipeltis, and Early Devonian agnathan of the order Heterostraci. Fieldiana: Geology, 16, 89-116. Denison, R. H. (1970). Revised classification of Pteraspididae, with description of new forms from Wyoming. Fieldiana: Geology, 20, 1-41. Dineley, D. L. (1976). New species of Ctenaspis (Ostracodermi) from the Devonian of Arctic Canada. In Essays in Palaeontology in Honour of Loris Shano Russell (ed. C. S. Churcher), pp. 26-44. Royal Ontario Museum, Toronto. Dineley, D. L. and Loeffler, E. J. (1976). Ostracoderm faunas of the Delorme and associated Siluro-Devonian formations, North West Territories, Canada. 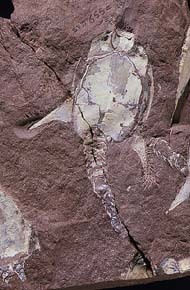 Palaeontology, special papers, 18, 1-214. Elliott, D. K. (1983). New Pteraspididae from the Lower Devonian of the Northwest Territories, Canada. Journal of Vertebrate Paleontology, 6, 389-406. Elliott, D. K. (1984). A new subfamily of Pteraspididae (Agnatha, Heterostraci) from the Upper Silurian and Lower Devonian of Arctic Canada. Palaeontology, 27, 169-197. Halstead, L. B. (1973a). Affinities of the Heterostraci (Agnatha). Biological Journal of the Linnean Society, 5, 339-349. Halstead, L. B. (1973b). The heterostracan fishes. Biological Reviews, 48, 279-332. Janvier, P. and Blieck, A. (1979). New data on the internal anatomy of the Heterostraci (Agnatha), with general remarks on the phylogeny of the Craniota. Zoologica Scripta, 8, 287-296. Kiaer, J. and Heintz, A. (1935). The Downtonian and Dittonian vertebrates of Spitsbergen. IV. Suborder Cyathaspida. Skifter om Svalbard og Ishavet. 52, 1-26. Novitskaya, L.I. (1971). Les Amphiaspides (Heterostraci) du Dévonien de la Sibérie. Cahiers de Paléontologie, Centre national de la Recherche scientifique, Paris. Obruchev, D. V. and Mark-Kurik, E. (1968). On the evolution of the psammosteids (Heterostraci). Eesti NSV Teaduste Akadeemia Toimetised, Geoloogia, 17, 279-284. Soehn, K. L. and Wilson, M. K. V. (1990). A complete, articulated heterostracan from Wenlockian (Silurian) beds of the Delorme Group, Mackenzie Mountains, Northwest territories, Canada. Journal of Vertebrate Paleontology, 10, 405-419. Tarlo, L. B. H. (1964). Psammosteiformes (Agnatha). 1 General part. Palaeontologia Polonica, 13, 1-135. Tarlo, L. B. H. (1965). Psammosteiformes (Agnatha). 2 Systematic part. Palaeontologia Polonica, 15, 1-164. Tarrant, P.R. (1991). The ostracoderm Phialaspis from the Lower Devonian of the Welsh Borderland and South Wales. Palaeontology, 34, 399-438. White, E. I. (1935). The ostracoderm Pteraspis Kner and the relationships of the agnathous vertebrates. Philosophical Transactions of the Royal Society of London, B, 225, 381-457. Heterostracans are the most diverse group of pteraspidomorphs and lived during the Silurian and Devonian periods. Among the most primitive heterostracans are tolypelepids (top right). Most heterostracans are pteraspidiforms, such as the pteraspidids (bottom right), protopteraspidids (bottom left) and the huge psammosteids (top left), which are the youngest known members of the group. After Janvier 1996 AND Soehn, K. L. and Wilson, M. K. V. (1990). A complete, articulated heterostracan from Wenlockian (Silurian) beds of the Delorme Group, Mackenzie Mountains, Northwest territories, Canada. Journal of Vertebrate Paleontology, 10:405-419. Page: Tree of Life Heterostraci. Authored by Philippe Janvier. The TEXT of this page is licensed under the Creative Commons Attribution License - Version 3.0. Note that images and other media featured on this page are each governed by their own license, and they may or may not be available for reuse. Click on an image or a media link to access the media data window, which provides the relevant licensing information. For the general terms and conditions of ToL material reuse and redistribution, please see the Tree of Life Copyright Policies.